Mosta FC have embarked on a remarkable player-recruitment strategy this season, a policy aimed at not only bringing in talented foreign players but also to attract valuable sponsorship money, a pre-requisite to the club’s ambitious plans of European football in the near future. The Premier League outfit raised a few eyebrows this summer after luring to their fold no fewer than 19 overseas players, an unusual move given that clubs in the top flight can only have six non-Maltese players in their match-day squads. George Galea, Mosta FC president, told a news conference yesterday that they have taken this approach after securing a collaborative agreement with Parma and Brescia, from the Italian league, as well as Slovakia’s Trencin. All three clubs are providing Mosta with foreign players and a financial package to support their stay in Malta. 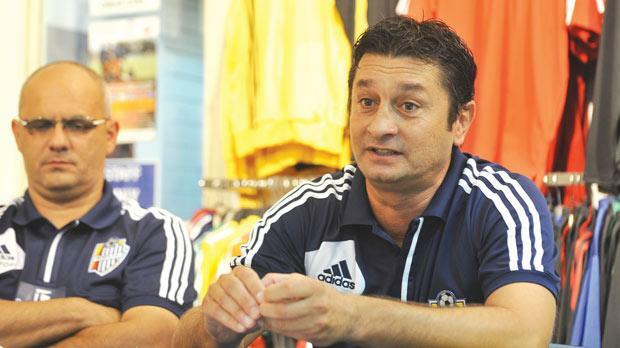 “It’s the aim of Mosta FC to continue where we left off last season when our team qualified for Championship Pool football,” Galea said. “In January, we were criticised for parting ways with various established players but this time we are making sure not to encounter the same kind of financial difficulties we had. “To this end, our technical director, Enrico Pizzone, has been instrumental in helping us strike the deals with Parma, Brescia and Trencin. They are providing us with quality players, some even from the junior ranks. Galea said the deals came at the right moment for Mosta as next season, like all clubs, they will have to abide by the Financial Fair Play rules. “We want to make sure that this club will adhere to the new regulations without extra problems,” Galea said. “We want to see our players having a positive season but we also want to strengthen other key areas in our structure. In fact, we are now giving due importance to the nursery as we believe that we have several young players who can make the grade in the Premier League. Mosta are currently fifth in the standings with 12 points. Lately, they have completed the moves of eight new foreign players to join Danilo Doncic’s squad – Francesco Calcagno, Nicolo Cosentini, Ilario Lanna and Simone Melizzi, of Italy, Brazilians Armando dos Santos and Christian Martins, Romanian Sorin Oproiescu and Chilean Francisco Arrigiada. Harouna Bara and Stefano Rosciani are also on the Mosta books and will primarily play in the Youth League. Doncic said Mosta now have a competitive squad and vowed to do everything he could to lead the side to Championship Pool football. “I am very pleased with the contribution of all my players. They’ve already shown that our team can play on level terms with the rest in the Premier League. We want to finish among the top six and we’re dedicating all our efforts to reach this objective. “The team had an encouraging start but there are still a lot of matches to be played. During the news conference it was also announced that Mosta FC had signed a deal with Eurosport which sees the Blues adopting Adidas apparel for the next three years. “We are proud to have struck this agreement with Mosta FC,” Christina Peresso, representing Eurosport, said. “Mosta are the 18th club to be sponsored by Eurosport this season and we feel that it is our duty to provide our teams with the best apparel we can get.